The "Peace Angel" was truly inspired. After days spent drawing bits and pieces of "nice" but "not good enough" parts of an angel... I made a wish in my heart. I asked that the real angels would help me bring this angel to life... I put on some angel music ["In Search of Angels" by Windham Hill] and started to draw... each part fell into place like magic... within 30 minutes she was completed and stared back at me in the exact way you will see her. Her blue wings rise upward, her arms reach out to you, her gown floats in swirls of golden pale buttery tones. The design needed no colorful brocades or complicated beading patterns. Her simplicity seemed to be enough. 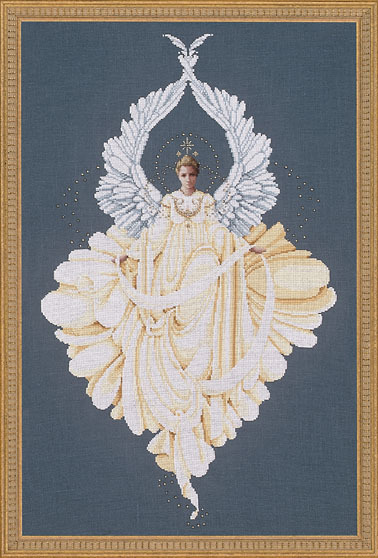 Her whole gown is done in six shades from white to gold... her wings in just three shades of blue. Yet I feel she is the most spectacular angel I have ever done. I scattered some floating beads and a few sparkling touches on her bodice. I promise she will be a joy to stitch and one that you may have to do more than once because others will be drawn to the magic that created her. This design convinced me that I am only an instrument... I hold the pencil... now you must hold the needle. ( ) indicates number needed. Copyright © 1995 Marilyn Leavitt-Imblum. All rights reserved.